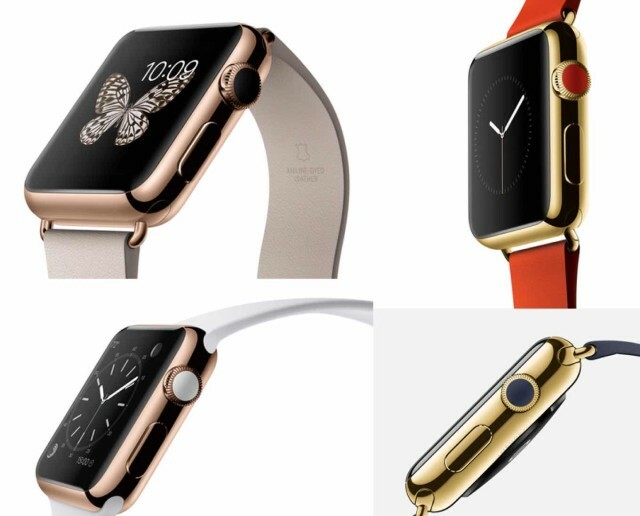 Apple might allow you to customize the Apple Watch’s digital crown. Here’s a small detail you might have missed about the Apple Watch. In pictures for the Apple Watch Edition, the 18-karat solid gold version of Cupertino’s upcoming wearable, the Digital Crown has a small dot at the end that matches the color of the watch strap. But here’s a question for you: Is Apple going to allow users to customize the Digital Crown as easily as they can swap out Apple Watch wristbands? Over at the Six Colors blog, posts some interesting thoughts about how Apple might go about allowing users to customize the color tipping the Digital Crown. One of his best theories, although it’s definitely a little crazy, is that the tip of the crown is actually a miniature LCD screen on the Apple Watch Edition, which changes its color when you swap in new bands! That’s an awesome idea, but it seems a little out there, even for Apple. But if that’s not it, what is it? Moren ultimately says the simplest solution is probably the best one. Let’s go with the simplest solution: you’ll probably pick the accent color when you buy it, and then basically be stuck with it, no matter which band you choose. The thinking perhaps being that most people will stick with a single watchband, viewing the whole watch-plus-band as a single unit (like most fancy watches). Cool as swappable crowns would be, I’m hard pressed to imagine that the crowd Apple wants this model to appeal to — the fashion-conscious market — is going to be keeping track of or swapping out replacement dots/crowns. I think that’s probably right. For one thing, replacing a small dot on the end of a Digital Crown is a lot more fiddly than the kind of solution Apple usually favors. For another, I doubt that most people will really care that the small dot at the tip of the crown doesn’t match the band. But here’s a thought. The Digital Crown is probably the part of the Apple Watch that will wear out the quickest, since you’ll be constantly twisting and turning it to interact with your device. For the expensive Apple Watch Edition devices, which could cost thousands of dollars, is it really so crazy to think that Apple might not make it easy to swap out the Digital Crown in case it gets worn out? And if it does, selling a replacement Digital Crown along with every Apple Watch band would be a fairly trivial thing to do. This entry was posted in iRumors and tagged Apple Watch, Digital Crown. Bookmark the permalink. Microsoft Offers 100GB Free OneDrive Storage Free for 2 Years. This great free iPhone widget adds a full phone app to Notification Center.